What a rollercoaster year! From the world's biggest car maker collapsing in to a distinctly un-Germanic crisis to the scandal at Top Gear TV show, 2015 has been a gift to headline writers everywhere. Here's our look back at the motoring year that was 2015 - complete with the biggest surprises of the year. Click here for the 2015 cars we road tested - by numbers. In-car gestures have always had their uses, but who’d have thought we could put the single digit to more productive use than merely casting doubt on that van driver’s parentage. BMW has fast-forwarded us to a world where a mere waft of the hand or waggle of the finger can control in-car functions such as music volume, phone and nav settings. The system, which rocked up for the first time on the 2015 7-series, works via a 3D sensor located in the rear-view mirror assembly. The downside? You might inadvertently cause a road-rage incident while trying to turn up The Archers. Uncharacteristic doesn’t cover it – this is up there with The Queen swearing in public. Rolls-Royce, having kept its serene counsel while all around have been rushing about like panicked cats at the increasing rise of global SUV sales, gives in and announces a crossover for 2018. Worse, over-umlauted Rolls boss Torsten Müller Ötvös has been publicly sniffy about Bentley’s ‘number two in the market’ Bentayga, stated that he ‘loves’ the name Cullinan (the Rolls’s codename, lifted from an appropriately gauche massive diamond), and predicted that the SUV will ramp production to record levels, making Rolls less exclusive than Ferrari. Jolly uncivilised. We’re pretty sure page one of the CEO Handbook lists what not to do five minutes into your first major public speech. Number 1: don’t collapse in a heap on the floor. New BMW boss Harald Krüger clearly hadn’t read the book, and his spectacular faint during BMW’s press conference at the 2015 Frankfurt motor show thus became one of the most viewed – and most disturbing – images of the year. Exhausted by a hectic travel schedule and the stifling heat on BMW’s biggest ever show stand (12,000sq ft! ), 49-year-old Krüger first staggered then fell backwards, before being helped by his aides. He’s fine now, but it was a timely reminder that even the biggest players in the industry are mere humans underneath. Perhaps dazzled by its success with a recent run of really excellent but quite sensible road cars, Mazda got completely carried away at the Tokyo show and revealed an outrageous rotary-engined sports car. The RX-Vision is less in step with the zeitgeist than smoking in a nursery, but it looks the absolute nuts and – speaking of nuts – Mazda bosses say they’re going to make it happen ‘because if we drop the rotary the technology will disappear from the world.’ Given that it’s thirstier than Amy Winehouse and dirtier than a Chinese power station the Wankel engine seems ethically unpromising, yet it’s compact, light, smooth… and epic. We’ll believe it when we see it, but we do want to believe it. Somehow a series of quite cheesy adventure films about a misogynist loner have become the default conduit to virtually every consumer on the planet (and four more on the International Space Station), but the usual convention is for car makers to place existing products on screen. Not so this time – Aston Martin built an entirely new model just to star in Bond 24, the first time this has ever happened. Legend has it that Spectre director Sam Mendes saw a sketch on the wall at Gaydon and said ‘Want that one.’ So they built the DB10, principally for a high-speed hoon round nighttime Rome. As for Jaguar, some of us had them cast as bad guys for electing not to go ahead with the staggeringly cool C-X75 supercar, so it was fitting that the seven scrambled lash-ups JLR provided to Eon Productions were helmed by the villainous Mr Hinx. The ongoing fashion for brands stretching themselves into uncharted territories took the most bizarre twist in 2015. Hyundai’s decision to strike out in pursuit of Mercedes, BMW et al seems akin to Lidl setting up in New Bond Street and having a tilt at Tiffany. Giving the new sub-brand a silly name – Genesis, in this case – seems to miss the fact that ‘premium’ customers buy brands first and decent products later. Hyundai aren’t aiming at us Brits, of course. No, it’s the Americans and Chinese they’re hoping to bamboozle with a flashy winged logo and designs by ex-Bentley shapester Luc Donckerwolke. If they want to crack the UK then I suggest they ditch Genesis for something more contemporary. ‘What do you drive?’ ‘Oh, I’ve got a Coldplay G90. You?’ ‘An Arctic Monkeys estate.’ You get the idea. In Graham Hill’s day we thought nothing of F1 drivers hopping over to Le Mans between Grands Prix and clearing off with the laurels. They were different times – don’t forget Denis Compton made 54 appearances for Arsenal AND scored nearly 6000 test runs for England. But while you can’t imagine Alistair Cook scoring in the Premier League or Wayne Rooney taking five wickets, motorsport still throws up the odd multi-discipline hero. This year it was German Nico Hulkenberg, who took advantage of a kind race calendar to jump from his Force India F1 car into Porsche’s third 919 entry at Le Mans. Failing to read the script, that had big-name Porsche signing Mark Webber spraying champagne, Nico won the race, with co-drivers Nick Tandy and Earl Bamber, and thus became the first active F1 driver to do that double since Johnny Herbert 24 years earlier. See our Le Mans 2015 blog here. A year ago there were two things we knew for certain about 2015: first, that the sun would rise 365 times and second, that Ferdinand Piëch would continue to be the boss of VW Group. At least we were right about the sun. Nobody foresaw Piëch’s unceremonial dumping from the VW supervisory board last April after 43 years at Audi and VW – not even Ferdie himself. In fact, his unshakeable self-belief could be considered the reason for his downfall – he spectacularly miscalculated the strength of support for CEO Martin Winterkorn, against whom he had launched a public attack. You can hardly blame Piëch for believing himself invincible – he’s credited with everything from the Porsche 917 to the Audi Quattro to the power of modern VW to the salvation of Lamborghini, Bugatti and Bentley. Trouble is, his back wasn’t knife-proof. How we reported Piech's departure here. Dieselgate. You know it’s bad when they invent a word for it and nobody needs to ask what it means. Volkswagen started 2015 as it had started dozens of previous years, with a reputation for solid engineering and good, honest products that won’t let you down. That is, ironically, the very reason they got caught cheating the US emissions test – Europe’s clean air group expected the cars to pass the more strenuous US test, and hoped to use that to lobby for an equally tough test in Europe. 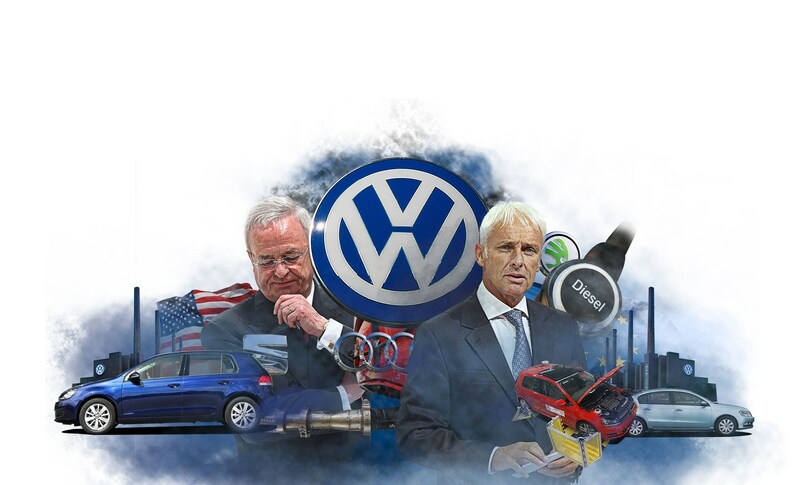 But to their astonishment, they uncovered the scandal of the year, and VW ends 2015 synonymous with misleading customers and riding roughshod over environmental imperatives. Who saw that one coming? Not sure why we’re quite so surprised, given that Jeremy Clarkson has always been a smouldering cigar in the politically correct powder keg of the BBC, but when the explosion came they heard it in Dar es Salaam. The idea of Top Gear telly without JC and his stooges does seem kind of odd, but arguably no odder than Top Gear telly with Chris Evans at the helm. And let’s not forget that motoring TV was at ground zero as recently as 2002, when flatlining TG was rescued by a former presenter with a bold new vision. So anything could now happen. How history remembers all this will ultimately depend on the relative merits of the now competing car TV shows we’ll all be treated to in 2016. Who’s your money on? Click here for a recap of Jeremy Clarkson's 'fracas' and the end of Top Gear as we know it. Click here for a look back at the cars we drove in 2015 in numbers. The year's best pictures: 2015's finest photos.